I happened to catch this yellow jacket while shooting interesting details at the Corunna Historical Village. 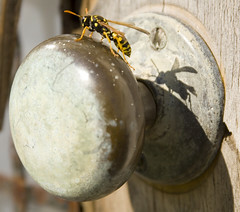 I was shooting the door knob on this home when the yellow jacket crawled out from behind. I'm just glad I didn't try to grab the knob.